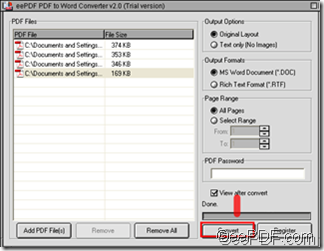 Can I convert PDF files to Word documents with the text only? Yes, you can use eePDF PDF to Word Converter to keep the text only in your documents converted from PDF to Word. 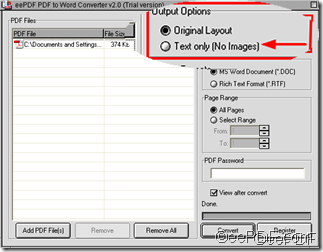 The output setting function provides you two options to set the output layouts of the documents converted from PDF to Word, You can either choose to preserve the images, graphics, multi-columns, tables, etc. 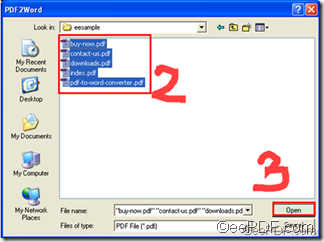 form the original PDF files to Word documents, or choose to keep text only in the Word documents. 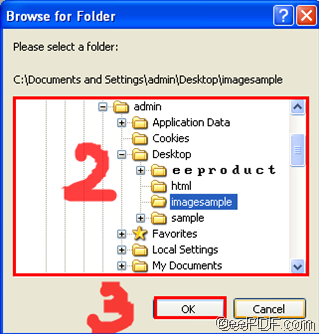 Click the radio box preceding the second output option Text only (no images), then go on to set the other items on the other group boxes like page range selection. After you finish setting, you can go on to convert the PDF files to Word documents and save the outputting documents in the proper directory. The following screen shot illustrated below present the effect of conversion from PDF files to Word documents with text only . 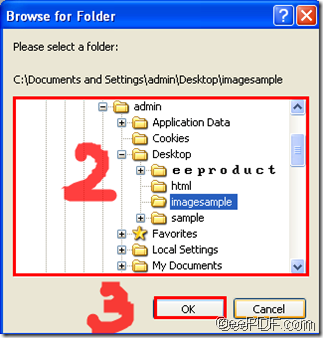 To learn more information about eePDF document converters, you can visit eePDF website at http://www.eepdf.com. How to convert PDF files to Word documents? 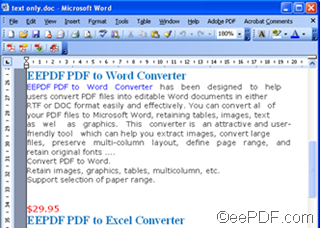 When you convert normal PDF files to Word documents, you can try eePDF PDF to Word converter, which can effectively and quickly convert the PDF files to Word documents in a very easy way. It enables you to edit and reuse your PDF content, and helps you preserve original layout, maintaining text, images, vector drawings of the source PDF files. 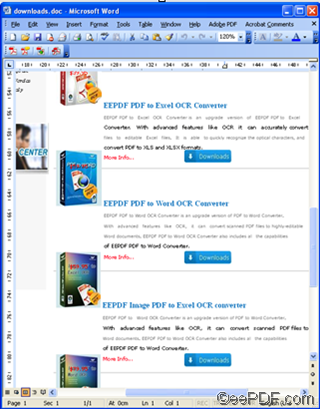 eePDF PDF to Word converter is available at http://www.eepdf.com/pdf-to-word-converter.html. 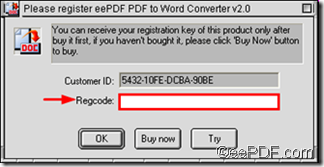 If it is the first time for you run eePDF PDF to Word converter, you may see the following prompt which reminds you to register eePDF PDF to Word converter. If you only want to try it this time, you can click Try and go to the next step. But you can only use the free version for 100 times before you buy it. 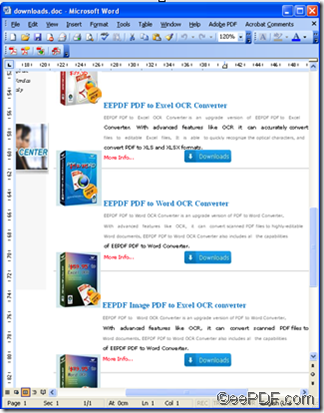 If you want to register, you can buy the software at http://www.eepdf.com/pdf-to-word-converter.html. After you pay for it, you will receive your registration key of this product. You can type the register key into the edit box of Recode as illustrated below, and click OK.
Then, when you see the following prompt, click OK again. 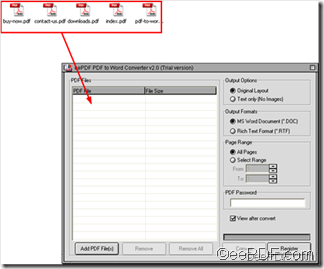 The first one titled Output Option provides two options for you to either maintain the original layout like multi-columns, images and graphics of the source PDF files or remain only the text from PDF to Word. 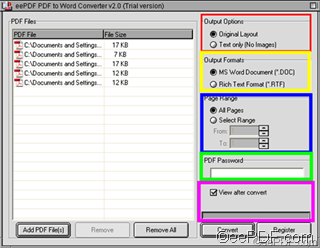 The second one titled Output Formats enables you to either convert PDFfiles to Word documents in DOC format, or in RTF format. 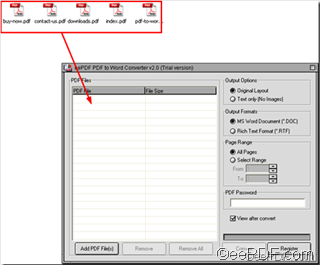 The third one named Page Range provides page range selection, You can choose to convert all the pages of the PDF to Word, or select some pages to convert from PDF to Word. 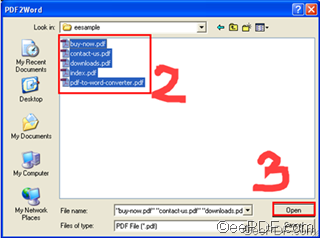 The fourth one called PDF Password enables you to convert password protected PDF files to Word documents, As long as you have either the user password or the master password, you can convert a PDF file to a Word document. The last one enables you to view the process of conversion and to view the effect of the outputting PDF files. 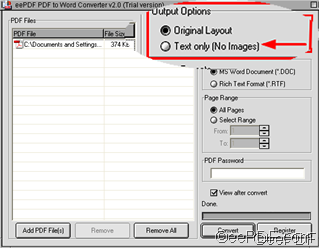 Click Convert > select the directory to save the outputting file in the Browse for Folder dialog box>click OK to start converting from PDF to Word. 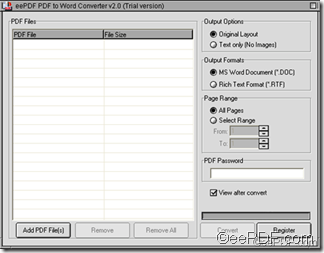 So far so good, now let’s see the effect if the conversion from PDF to Word via eePDF PDF to Word Converter .